Lefty Kreh Finesse Rods complement the TFO line by offering a more "traditional" taper and action for those who fish small flies and fine tippets on light lines. Your Game Just Got Saltier! Now available in a delicate 2 wt. through our popular 10 wt. These travel rods have taken TFO's reputation to new levels. Achieve maximum line speed with minimal effort. The culmination of Tim’s relentless tweaking, the BOOST is built for anglers with a more aggressive casting stroke and offers the ultimate balance of power and precision. 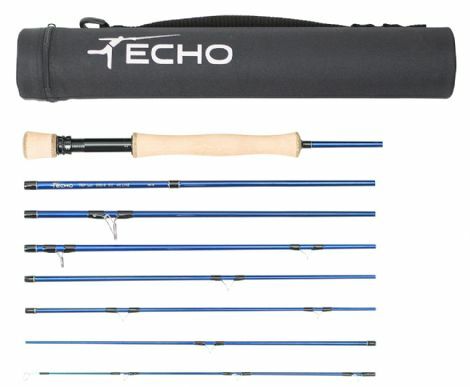 The ECHO Dry series is designed to present dry flies and small nymphs to stream-dwelling fish. A true all-around performer with the features and feel associated with rods four times the cost. The new ESN Series with Konnetic technology makes for an extremely light rod, ideal for the repetitive casts the nymphing precision method requires. Despite the trends for going shorter on all things in the two-hand world, there will always be a place for full length rods. With trends in modern spey lines getting increasingly compact, it was time the rods were designed with these new lines in mind. The new Trout Spey is specialized for when the bugs aren’t hatching and you want to cover the most amount of water with a sub-surface presentation. Sick of rods that wilt under the strain of a sprinting 40-pound ‘Nook? No more - the King is your huckleberry. What do you do when you have a slight hitch in your giddy-up? If you are a two-hand fly fisherman who owns their own rod company, you simply create a family of rods that help you cast better. You asked and we delivered. The Boost Beach was designed for overhead casting to surf-dwelling species on both coasts. Light and fast, the Shadow II offers critical line feel and control with an action that will also toss a loop when the bugs start flying. With the growing demand for specialized Euro Nymph rods, the demand for a rod that fits the needs of anglers that are not looking to compete at the national championships has also been growing. The B.A.G. is a rod designed for big game fisheries where you need to huck big rigs to big fish and do it quickly. Finally - an affordable switch and two-handed fly rod that really performs! The new CHROMER rods are the ultimate tool for the two-handed angler. With refined rod actions to suit a variety of casting and line styles, the rods also feature custom polymer gripping sections on the top and bottom handles. The CRUX rod offers our all new Line Speed Taper, for confident short to mid-range delivery of flies and effortless extreme distance casting.